ISeePass is a handy online password revealer tool that helps to show your hidden passwords. With just a single click, it can reveal actual password hidden behind asterisks (*) or bullets (dots). It is really helpful in case you forget your original password, that you have saved using browser’s autofills option or remember my password facility. To remind you of your original password, this password revealer tool comes in handy. No setup download or sign up process is required to use this simple yet handy tool. You just need to use its bookmarklet through your web browser and it will reveal password, just like visible in screenshot below. ISeePass works with all supported browsers and with all websites, like Gmail, Facebook, YouTube, and more. We have also covered some best free password managers for you. How To Use This Password Revealer Online Tool? To bring this tool in usage, you need to access its homepage link, and install its bookmarklet on your browser’s bookmarks bar (or you can say bookmarks toolbar). You can find homepage link of this password revealer tool at the end of this review. On its homepage, you will find ISeePass icon (highlighted in screenshot below). Drag this icon and drop it to bookmarks bar. If bookmarks toolbar of browser is not enabled, then first activate it, and then add this icon. After adding its bookmarklet, open any of your website accounts whose password you want to reveal, which is saved by browser. Now just tap on ISeePass icon. It will immediately show you original password. After remembering the password, you can hide it back using bookmarklet. It is recommended to reveal your password only when nobody is around you. Very useful tool that can remind you of your original password. It can also be used while entering a complex password. To avoid wrong password or password didn’t match errors, ISeePass will be helpful. 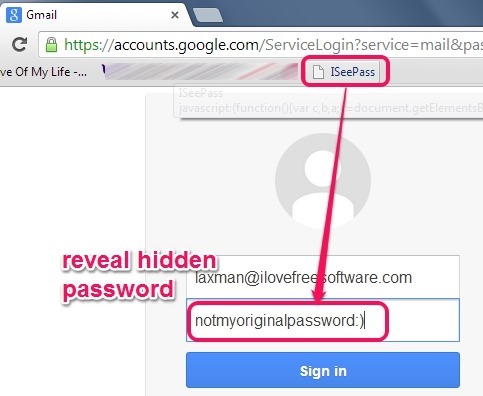 One-click action is required to reveal the password and hide it back. No sign up, no download process. Just a simple tool that you need to add on your browser’s bookmarks toolbar. Check out some best key loggers to record keystrokes on your PC. ISeePass is a pretty good tool to reveal hidden passwords in a matter of seconds. No technical knowledge or extra efforts are needed. A simple solution to get back forgotten passwords. Don’t forget to check this free password cracker to recover and crack login passwords.